To explain the workings, I have broken the layout into coloured Zone. 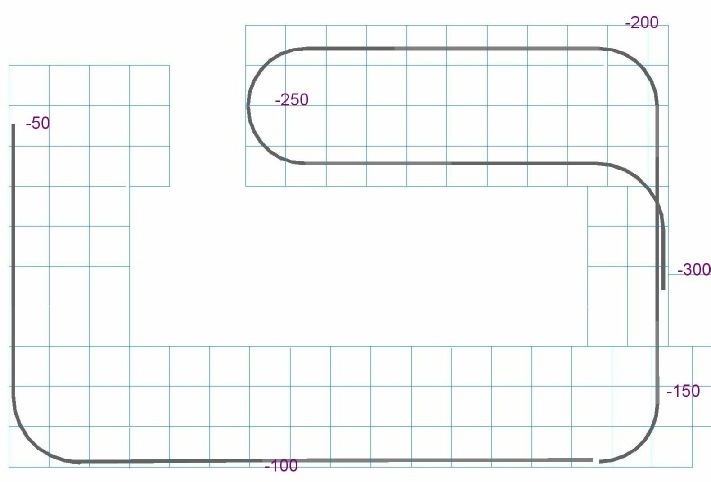 As this design is very 3 dimensional, many of the tracks are directly above each other in places and a single plan view drawing is very confusing! By splitting the drawing up into levels, hopefully it will be more understandable. 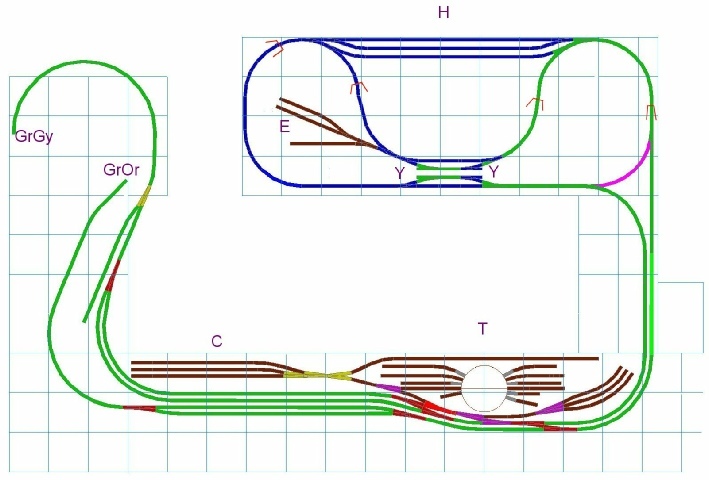 The normal path will bypass the triangle bottom right of top board (purple, so trains will run round the loop and and converge as a double track heading down the thin board on the right. They continue along the bottom and both split as they pass through the two platform station. 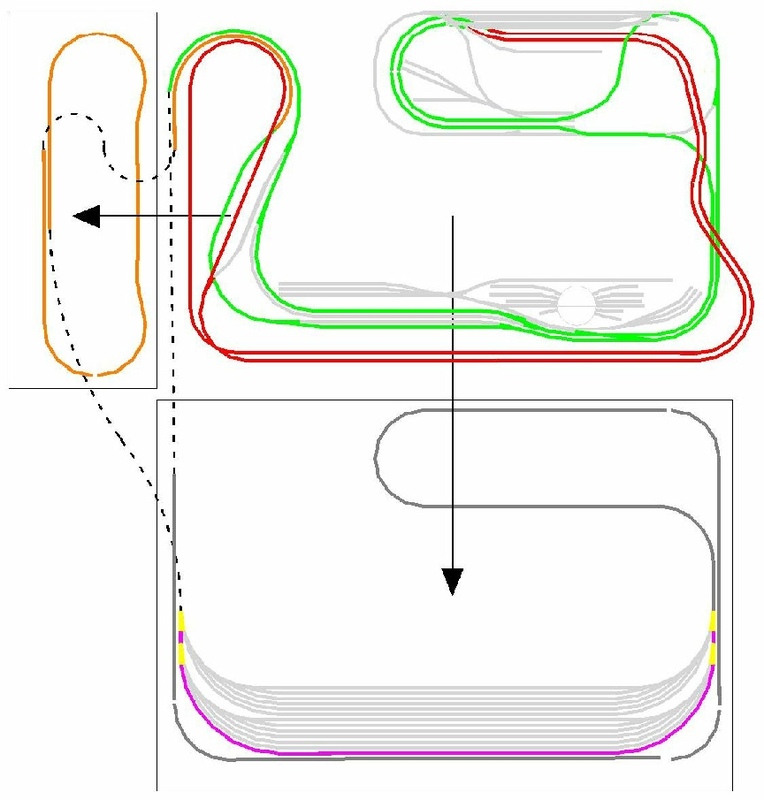 The lowest track passes under the red track (not shown here) and dives into the board just before GrOr and then becomes the orange Zone. The other track remains at level 0 until GrGy when it starts to dive down and becomes the grey Zone. There is a siding that is directly below the red siding for hopper unloading. C is a container and goods yard. T is the main engine storage area, a long head shunt, turntable and siding. The other part of phase 1. The top of the double yellow tracks has a three platform station at level 100. As the tracks leave both ends of the station they immediately decline down to level 0 at 00 and join the blue and green tracks shown above. The length of these declines is short so the inclination is too steep, remedial design will be implemented after phase 2 is complete. The left of the station has a double cross over leading both tracks to the red zone at YR shown below. Phase 2. 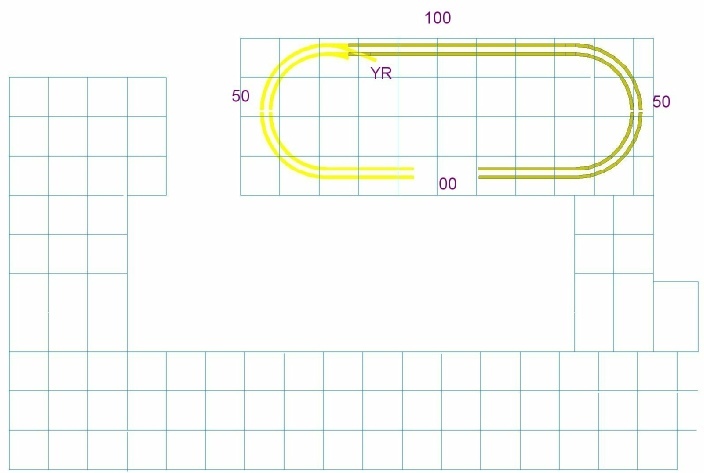 The two tracks coming from the yellow zone on the top board run at level 100 down the thin board on the right, but at the right corner, the top line declines to level 0 at the right lower corner then inclines again round the top loop and on to the lower left corner back at level 100 and over itself. There is a siding for a hopper train to discharge into an open wagen train below. The whole of the lowest track is on viaducts and bridges. There is a siding on the outside of the level 100 station for a terminus DMU. Phase 3. Approximately 300 to 400mm below the main lower board will be another, this will contain a 12 lane storage yard, capable of holding two trains in each lane. 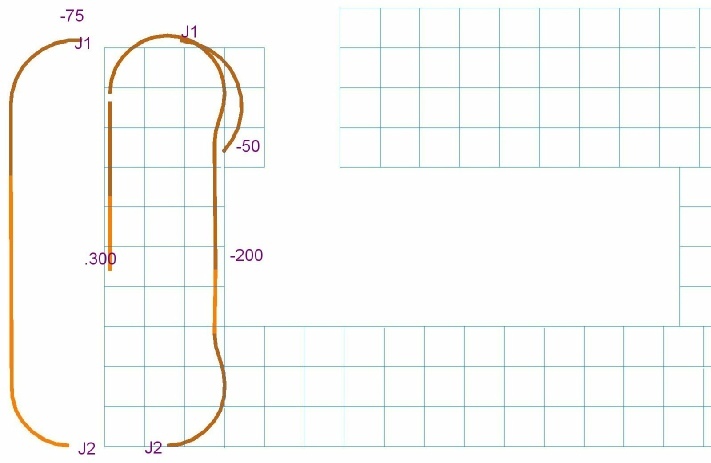 This will be fed from the Orange zone and go out via the grey zone, both being effectively a helix, but utilising the underside space of the boards, rather than a circle in one spot. Phase 3. The green zone connects at GrOr to orange at level -50. For clarity the left side has been moved over right but normal would be connected at J1 and J2. 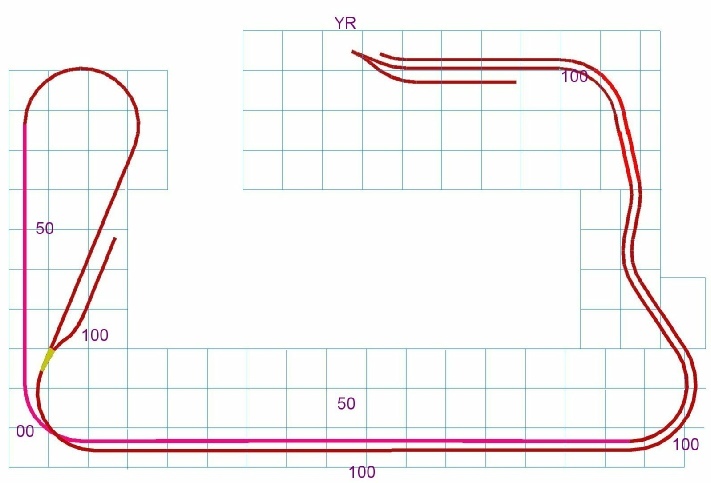 The decline continues clockwise and ends after the ltop curve at level -300 and connects the left of the violet storage yard. Phase 3. The green zone connects at GrGy to the grey at level -50. This is the end of an incline that continues anti-clockwise and ends after circumventing the underside of the top board at level -300 and connects the to the right of the violet storage yard. Just for fun, here is the complete track plan, but as you can see, it just looks like a jumbled mess without knowing all the levels. 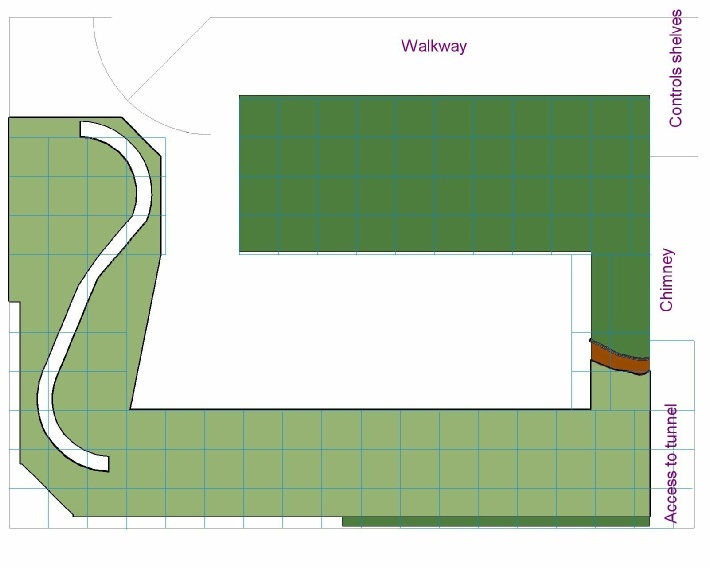 A plan view of the room showing level 0 boards. Each of the blue grids squares is a foot square. 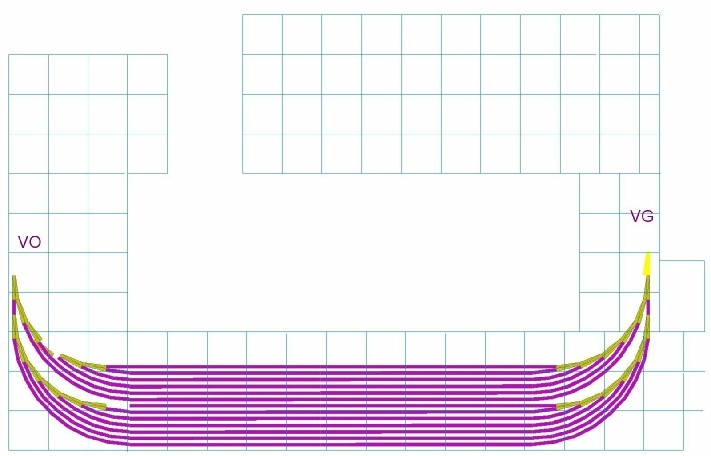 And finally a view of the 3 loops with non main coloured light grey and simplified and 2 parts split off to show that the main line is really just one loop!